Happy Holidays Blog Hop Peeps! I can't believe it's already December!....where does the time go?.... It's an exciting month isn't it? 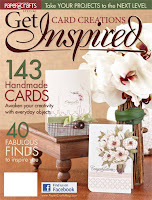 Card Creations: Get Inspired, Hanukkah, Christmas, New Years....Did I mention Card Creations: Get Inspired? That's the news I've been waiting to tell you about! 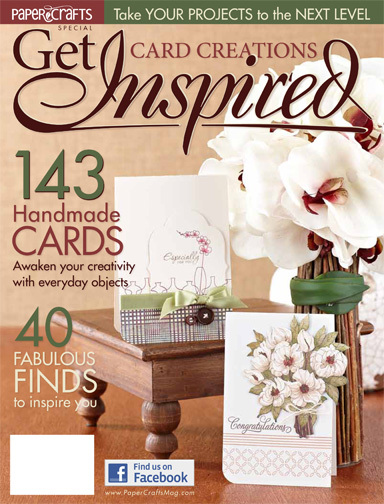 It's an all new publication from Paper Crafts based on their very popular Get Inspired column featuring cards inspired by everyday things. Like shoes, throw pillows, shoes, sweaters, mirrors, shoes, plates and cups, jewelry....did I mention shoes?....the list goes on. I bet you didn't realize there's so much around you to inspire fantastic paper creations? I had SO much fun creating for this issue....photos are my favorite things to inspire my creative side.... They gave us 40 different photos of typical things you'd find, well, anywhere, and asked for literal and interpretive creations inspired by them. I tried to make 2 for each all the photos....80 total.....BUT..... I only got 35 done....tee hee.... It was SO much fun! Some were really easy to create from, but others were really hard. I found the literal creations the easiest to make on most of them, however my favorite creations were the ones I took creative licence with. This is the literal creation....can't you tell?.... I've had these fabulous holiday words for a year now and am excited to be finally using them. I didn't have 'believe' so I used 'Christmas' instead. Wanna know how I made the lush 'ornament' garland along the bottom? 1. Gather up your items. Large and small glue dots (Zots), glitter (Martha Stewart), buttons, pearls or rhinestones and your card.. FYI - I used the Cuttlebug houndstooth folder for the top panel of my card. 2. Cut your strip of large glue dots to separate each one (this makes it easier to place them where you want). 3. Adhere 3 glue dots in a random pattern (not to close together). Sprinkle with same color glitter. Repeat 3 times. If wanted - Add small glue dots and add dazzling diamonds glitter. *TIP* when adhering the glue dots, plan on clustering 1 of each color in a loose group. 4. Embellish with buttons, pearls and rhinestones. Now, on to the interpretive one....and my favorite....a little shabby chic creation with lots of whites and I've added in the glitter and sparkle with the sentiment and the pin. See that fan-tab-ulous shimmer paper? Sorry, I picked it up on my recent trip to Copenhagen, but it's made by Annie P Paperie. I think there may be a place in New York....for those of us on this side of the pond....check out her fabulous things here. Have you been inspired? I certainly hope so! As a thank you for joining me today, leave a comment below and you'll name will be entered into a drawing for a copy of this fabulous issue! 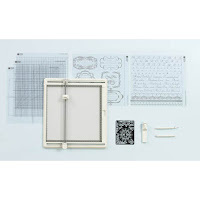 THEN visit the Paper Crafts Connection blog and be entered to win an AWESOME new Martha Steward tool, the Craft Station! 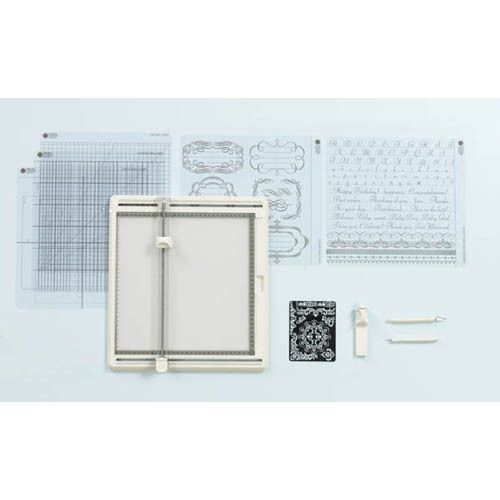 The Craft Station includes a 12”x12” LED light table and glass cutting mat, a cutting shuttle and movable ruler arm, three cutting blades and cartridge, a metal stencil, a stylus, five 12”x12” tracing templates, a cutting knife and an alignment guide. Retail price is $165 - AWESOME!! Don't forget you can find inspiration in anything around you. Don't believe me? Check out the Card Creations: Get Inspired and you'll see how easy it is. Beautiful cards! Love the glue dot glitter circles in the first card and the second card is so soft and pretty! Wonderful cards! I love the buttons. okay, seriously? your mantle? ridiculously gorje! i love everything about it, especially the COLOURS! that mustard/gold and turquoise combination is TO.DIE.FOR. the stocks are fabulous and that little tiny bit of word art is a perfect little message for the holidays, or ANYtime. i just want to sit in front of the fire and hang out with you, sipping cider! the cards are fantastic, and i NEVER thought to add glitter to plain ol' glue dots! how clever are you?! Love the buttons and thanks for the tutorial so I can recreate on my own! Lovely projects, great tutorial! The glue dot glittered circles are so fun! Beautiful cards! Love how you did the border strip on the first one. Your home is gorgeous!! The colors of buttons are my favorite & the same that I'm using for holidays to match the decor in my small NYC apartment...a much smaller scale than your home. Beautiful cards and love the idea with the cute buttons glue! WOW these cards are so amazing....I love what you did with all those buttons and the large sentiment...so creative...I love it.. I really enjoyed reading your blog, is that due to Cristy's talents? So often I just skim through the journalism. Your card is delightful and I appreciate the nontraditional colors on your mantle. I love your beautiful fireplace!!! Both cards are LOVELY - as is your mantel! I love the colors you used! Thanks for the step by step on the garland. Such a great idea. Love your decor! And these cards are both beautiful. I just LOVE the button/glitter garland on the first. So clever, and the second is just so soft and pretty. Thanks! thanks for the tutorial ! !the card is fab !! Wonderful! Your living room is so pretty...and so are your cards! love the colors you chose! pinned it! thank you for showing us! Super gorgous card! I love the way you glittered the buttons and put them with the rinestones! Awesome fun! Thanks so very much for the chance to win! Gorgeous!! Love, love the buttons on the first one! Love, love the JOY on your favorite one! Merry Christmas! Awesome card. I love them both. Gorgeous cards. I must say that your mantle is absolutely stunning. Love it. 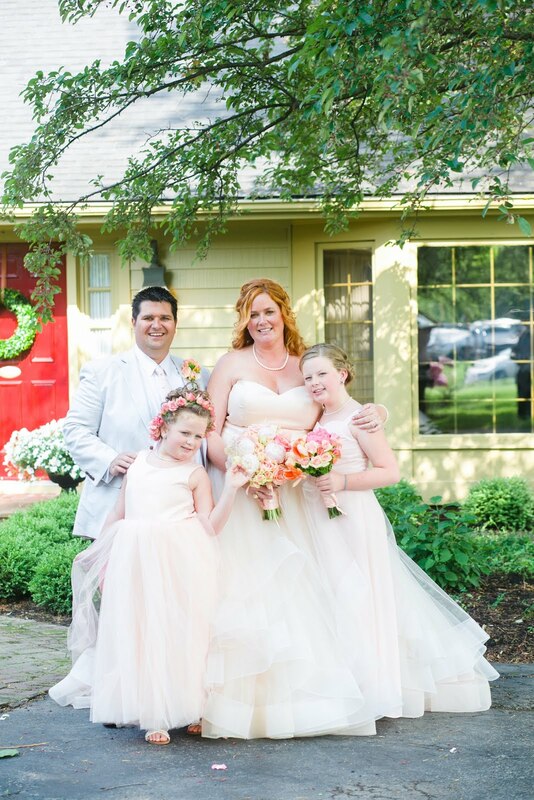 Stunning cards, Kristin! Those circles with the glitter are fabulous. I love all the layers and textures! Wonderful card! Thanks for sharing how you create the perfect circular spots of glitter - glue dots! this is such a 'WOW!' card... both of them! love your mantle, i never thought to holiday decorate with blue and yellow (i usually do teal and red, both fun!) and the glitter dots with the buttons are so so cute! The "Joy" card took my breath away with it loveliness. Oh, I love them both! How inspiring! And I've never used Glue Dots that way - now I need to try it! Buttons, glitter and Christmas-my faves! Thanks for sharing, its beautiful! Wow, beautiful cards and your mantle is gorgeous! oh my what a gorgeous mantle and equally gorgeous cards!! My fave is the "joy " card-my fave word and style. Beautiful mantle and card. Love the colors! Silver and gold as well as red and green are no longer the only Christmas colors. Use of blue, green and gold are stunning! Gorgeous mantle! Love all of those buttons. WOW, Kristin! Love your interpretation ... both creations are simply jaw dropping! Love the sparkle! fun & fabulous Christmas card! Great card! Thanks for the chance to win what looks like an awesome publication! Wow - what a lovely mantel! love both of your inspired cards - those buttons and sparkly glue dots look super! Beeeyootiful! That's such a dreamy room, and I bet it is amazing at night. Your cards are just gorgeous- I'm in love with the glitter dot/ button/ pearl border on the first card! Love this! Your source of inspiration is fabulous. :D Great cards, both!! What great inspiration, and a great project! Beautiful card and inspiration! I love those buttons. Great idea! I love it. Oh my goodness Kristin! I love your mantle! I want to go decorate mine now :) Love your cards, that second one is my favorite too. I am so sorry you are laid up with a kidney stone - my sister gets those and they are so painful! At least you can create while you are laid up! Thanks for sharing your beautiful creations! Love the buttons and the non traditional colors! Wow...your mantle...your home.....oh my Kristin. I just love love the one with the buttons...the beautiful doily on the other is gorgeous. I love that you sprinkled the glue dots. How clever is that! your card and home are lovely.. thanks for the inspiration and step by step instruction..
Love the wonderful mix of colored buttons blending in together. Just like Christmas! Love the Joy card. It has a vintage look to it. Thank you so much for sharing a tutorial with us - those are always fabulous! I just love your mix of glittery shimmer with the buttons - it's just perfect for your inspiration and this time of year! What a genius idea to use the glue dots with glitter! Your cards are fabulous! beautiful cards. love the buttos and blings. First, I think I want a mantle area as beautiful as yours. :) And your two cards are beautiful, too! First, I love your decorations. Then, both of your cards are wonderful. Definitely gonna have to try out that glue dot/glitter thing. Gorgeous! Thanks for the tutorial! Your cards are gorgeous. Loved how you made the garland on the Christmas one. Very creative! Wow -- both of your cards are amazing. Love the Christmas card with the buttons and glimmer especially. Your Christmas mantle is gorgeous -- I can certainly see why you love spending time by the fire in this room. LOVE the Christmas card - so incredible, so colorful, so much movement and happiness! love your circles of glue dot glitter! WOW, fabulous cards! and your Christmas deccies are soooo pretty too! Such great cards! Wonderful idea with the glitter circles =) TFS! So soft and romantic, love these! What a beautiful mantle you have! I love the row of buttons & glittered dots on your card. Two beautiful interpretations of a gorgeous mantle! These cards are both so BEAUTIFUL!!! I absolutely love your first card, the glittered glue dots mixed with buttons and pearls is stunning! lovely! I'm all for more glitter! Great cards! I like seeing non-traditional colors. Hope you Feel better soon. I love that your inspiration is the decor of your home, my home is also my inspiration. Thanks for sharing! Love your home Christmas display as well as your gorgeous cards! Totally awesome. Thanks for sharing the tip concerning the glue dots and your lovely creations. What a fantastic idea. I love your sparkly glue dots. Both cards are wonderful and so is your mantel! I like both your cards but think the Joy one is absolutely beautiful! Hmmm, not nearly enough sparkle on my mantle! Your cards are as unique and gorgeous as your mantle. Love the colors and neat way you made the glue dots into glitter dots, what a fun idea. Great cards. Love all the glitter and buttons on the first. So sorry about your kidney stones but love your mantle decor and both cards. Love the look of the glittered glue dots mixed with the buttons. Great job on this inspiration challenge, Kristin! Love the buttons and glitter on the first card! Funny sbout the paper from Copenhagen - I clicked the link expecting some far away company and find it's Australian, like I am! I am totally inspired! Wonderful cards. First, your garland over the mantle place and shelves are gorgeous! Love them against the soft yellow. Your button card is so happy. Those glittered glue dots are perfect fillers. The joy card is so gentle and sweet. Wow! Love all the glitters! Love those glittery circles behind the buttons, so creative. And your joy card is just wonderful in white! Thank you for sharing. Hi Kristin, I love your home decor and so much inspiration in there. I love your cards very simple, clean and beautiful. Glittering GlueDots? What a fantastic idea! Wow! Fantastic and so glittery! Thans for the inspiration and the chance to win! Gorgeous cards! I love that button and glitter garland!! Inspired!! Gorgeous inspiration and fantastic cards too - love how you've used the glue dots - I must try that.